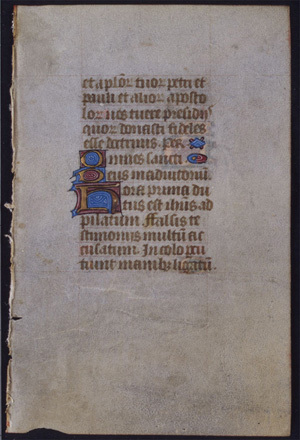 Text: This leaf contains text from the opening of the Hours of the Cross at Prime. A scan of the verso is currently unavailable. et apostolorum tuorum petri et pauli et aliorum apostolorum no tuere presiden[ ] quorum donasti fideles esse doctrinis. Per.